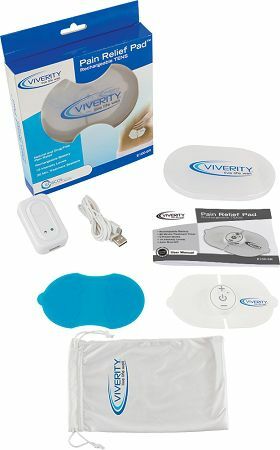 The Viverity Digital Wireless Pain Relief Pad is an advanced, rechargeable, wireless TENS device for home, work, or travel. This powerful device delivers prescription-strength relief for your back, neck, upper, and lower extremities. Use it anywhere on your body! Relieve your pain by using this 5 mode TENS device with everything you need. TENS (Transcutaneous Electrical Nerve Stimulation) delivers small pulses of electrical current through the skin to the nerves to modify pain perception and shutting out the pain message from ever reaching the brain. In many cases, this stimulation will greatly reduce or eliminate pain. Features a 5 mode TENS device with everything you need to start using immediately. The Pain Relief Pad is a simple, drug-free solution to help control your pain, allowing for a return to a normal activity level. FDA-approved for over-the-counter sale (no prescription required). Pre-programmed with five therapeutic phases adjusting throughout the cycle time for quick, safe, and effective relief. Includes: One (1) re-usable electrode, device, plastic carrying case, wall charger with USB cable, instruction manual, and convenient drawstring carrying bag to keep everything in one place. **NOTE: Only compatible with Viverity Replenish Pack wireless electrode pads. I love this tens unit. I can wear it to church with no problem and not wires to mess with. I would like to receive an email ever so often for the replacement pads so I don't have to search and search for them. Thank you God bless you. Very pleased with this unit, and customer service is outstanding! The electrical strength is not strong enough. The Tens Unit with wires are much stronger and bring more relief. I find this Portable Tens Unit very easy to use. You can still move about and the unit does not hinder movement. The unit is everything the Company says. ABSOLUTELY A MARVELLOUS INVENTION FOR WHEN I AM ON THE GO. THANKS SO MUCH. Q: What type of battery is required? The unit is powered by an internal battery that you recharge with the included USB cable. Q: Hoe does this device stay on my back? Will I have to lay on it, or will it stick there while I am sitting up? The adhesive gel on the electrodes that attach to the device is strong enough to hold on your back, even while standing upright. Q: Is this good for the knee? The Viverity wireless pad is in a butterfly shape, and is best used on the back or neck. Because of its shape, it would not be very practical to wear on the front of the knee, but you could certainly use it on the back of the knee, provided you are sitting or laying down while in use.